Tired of wimpy launch clamps? Well, then make any rocket launch an event by putting it on a Soyuz or Saturn V-style launch pad Board your crew, then go for ignition sequence start! Removed "layer = 0" line from the Saturn pad parts that have both ModuleAnimateGeneric and ModuleAnimated Decoupler. This was making these parts reset after the animation finished when staged. The included KSP 1.4.x versions of B9PartSwitch and Animated Decouplers work fine in KSP 1.5.x. Partial mesh-switching has been implemented for the Saturn swing arms, base inserts, a new hold-down arm type and the Russian Launch Stand. Two new types of Saturn pad hold-down arms. The Russian Launch Stand has been revised, it no longer has the separate arm assembly, as the clamp arms and one fuel arm have been built into the stand now; up to two additional fuel arms and the crew elevator tower can be added separately. See the Changelog for a complete description of the new and revised parts. Separately retracting fuel arm that can output LF/O, LH2 and MonoProp. NOTE: Fueling can't reach tanks above/past a decoupler due to stock resource transfer rules. Up to two additional fuel arms can be added separately. Separate retracting adjustable crew access elevator tower can be added. Launch Pad Base with crew elevator for access to the deck from the ground (no direct access to rocket at this time). Base is free-standing, does not need launch clamps, but does require the Tier 3 launch pad. The Soyuz pad is good for smaller rockets. Modular tower bases and sections to make a custom-sized tower for almost any rocket. Different general types of retracting swing arms sized for 1.875m, 2.5m, 3.75m and 5.0m tanks, with switchable umbilical types and colors (red and gray). Working crew access arms are also included. Special set of tower arms for the Bluedog Design Bureau Saturn V and Saturn IB, switchable between default (3.75m and 5.625m) and rescale (4.25m and 6.4m) sizes. Retracting Saturn V-style tail service masts and seven types of retracting hold-down arms. The Saturn IB milkstool, with switchable gray and red colors, plus switchable hold-down arm support configurations. Fully accessible by Kerbals with entrance ramp, walkways and an elevator to the lower level. The Saturn hammerhead crane, swithable between red-yellow and gray colors; can be decoupled and freely rotated with the Q and E keys (No actual hoist, though...yet). Both the Saturn launcher base and tower bases have elevators for crew accsss from the ground to the spacecraft. Drive your crew over to the pad, take the elevators up to the crew arm! Patches are included for TantaresLV, Tundra Exploration, FASA and Bluedog Design Bureau that add a size 5 node to the lower-stage fuel tanks or engine mounts for easier attaching to the pad bases. Module Manager is needed for the patches. Custom patches for other mod parts can be done by request if you don't know how to write an MM patch file. 1> Copy the ModularLaunchPads folder (NOT the GameData folder) from the ModularLaunchPads.zip file into your KSP GameData folder. The Subassemblies folder in the .zip goes into your KSP saves/xxxx/ships folder. 2> Select which version of B9 Part Switch you need (for KSP 1.3.1 or 1.4.3) and copy the B9PartSwitch folder from the .zip into your KSP GameData folder. 3> Select which version of Animated Decouplers you need (for KSP 1.3.1 or 1.4.3) and copy the AnimatedDecouplers folder from the .zip into your KSP GameData folder. If you have any craft files or saves that have any of the old parts, be aware that they do not load by default anymore. Craft files and saves may be broken. If necessary, copy the Old-Parts/Parts folder from the ModularLaunchPads.zip into GameData/ModularLaunchPads, and copy the contents of Old-Parts/3D-Assets to GameData/ModularLaunchPads/3D-Assets (or merge them). The old parts will not appear in any category or the tech tree, they are provided solely to enable craft files to be loaded so the old parts can be removed. 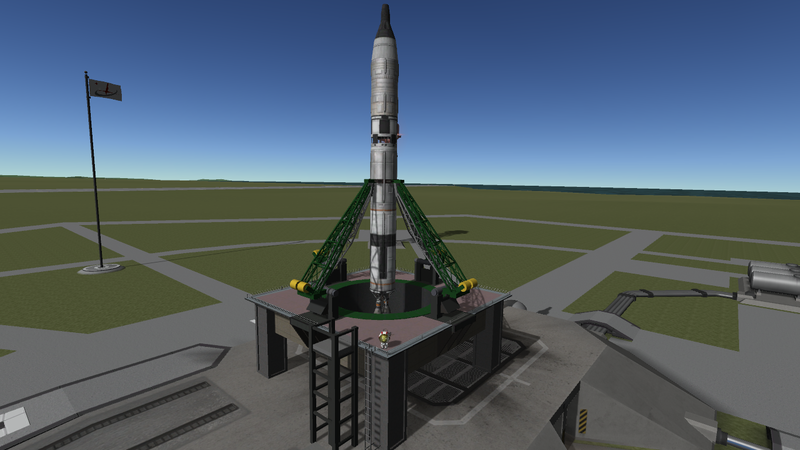 NOTE: This mod supercedes and replaces my earlier standalone Saturn Mobile Launcher mod. That older one shouldn't cause any troubles if it is left installed, as most of the new mod's parts have different internal names--but maybe not all. The old one should be removed first before installing this one. > The Russian Launch Stand no longer uses a separate arm assembly. The clamp arms and one adjustable (by mesh-switching) fuel arm are now built into the stand itself. The fuel arm can be retracted manually. 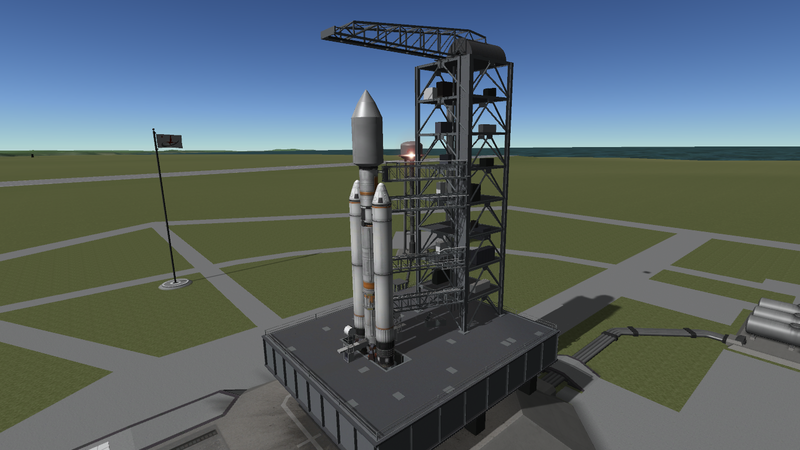 Two additional fuel arms and a separate crew elevator tower can be added as well. > Russian Launch Stand's clamp arms can also be turned off, so the big Soyuz Launch Pad's gravity-retract hinges and arms can be used instead. > Color can now be switched to the Soyuz Pad's green. > The Soyuz Launch Pad base now has switchable hinge-mount configurations, either at 90 or 45 degrees. > The clamp arms have adjustable-size clamp pads, done by the deploy limit slider. > Extra attach nodes are included on the base for use with the Russian Launch Stand's fuel arms and crew tower, as an interim step until I can make proper ones for the Soyuz Pad. > The color for the base's central ring, clamp arms and counterweights can be switched to the gray-drab color of the Russian Stand. > The individual tower swing arms have been eliminated. There are now new switchable Saturn tower swing arms, in four general sizes (for fuel tanks of 1.875m, 2.5m, 3.75m and 5m diameter), each with seven switchable umbilical connector types. There are also new BDB Saturn V arms with two different size options (for default and rescale sizes). Eventually the general type arms will vary more from the Saturn V ones they currently use as a base; this is a small step in that direction. > The individual flame hole inserts for the base have been eliminated. They have been replaced by a single square and rectangular switchable insert, both with multiple options. > The standard launcher base no longer has attach nodes for accessories like SRB hold-down arms and tail service masts, these are now in the new switchable inserts. > The tower base sections' elevators are now off by default, and have switchable maximum heights when turned on. The deploy limit slider can still be used to fine-adjust the stopping height. > What was the Type 1 and Type 2 hold down arms have been revised and renamed the Saturn V and Saturn IB Type B hold-down arm. The other hold-down arms have been renamed General Type [x]. > Two new hold arms have been added, a bottom-mount type and another one designed for the Saturn IB, the Type A. > New Saturn Milkstool with an integrated insert, i.e. switchable node and hold-down supports. > NOTE: Disable staging for any part (like swing arms) that is manually retracted, or move its staging icon into a stage above that of the launcher base, otherwise they will reset if staged. > ALL OLD PARTS ARE NO LONGER LOADED BY DEFAULT. They are in a separate folder called "Old_Parts" that is outside of the Gamedata folder in the .zip file. If they are needed to prevent craft and save files from breaking, copy the "Parts" foder from "Old_Parts" into the ModularLaunchPads folder, and copy the contents of the "3D_Assets" folder from "Old_Parts" into the "3D_Assets" folder in ModularLaunchPads. > Old parts won't appear in any category or the tech tree, they are provided solely to prevent craft and save files breaking so the old parts can be replaced. This is the last time old parts will be included. > Saturn tower swing arms are now back in the Structural category. > Added MM patch file for Tundra Exploration, it adds a size 5 node below the bottom of the three first stage tanks for attaching a launch pad. > Revised the custom category, old parts were removed, new ones added. If necessary, copy the Old_Parts/Parts folder from the ModularLaunchPads.zip into GameData/ModularLaunchPads, and copy the contents of Old_Parts/3D_Assets to GameData/ModularLaunchPads/3D_Assets (or merge them). The old parts **will not** appear in any category or the tech tree, they are provided solely to enable craft files to be loaded so the old parts can be removed. Patches for Bluedog Design Bureau, TantaresLV, Tundra Exploration and FASA are in the Patches folder; these add a size 5 node to various lower fuel tanks or engine mounts for attaching to the launch pad bases. 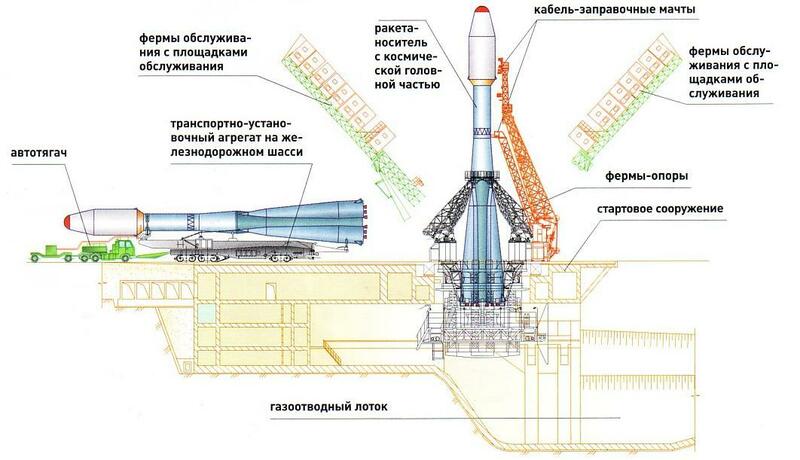 > This is an alternative to the big free-standing Soyuz Launch Pad. It's a node-attached launch clamp that can be used by itself, it includes four animated retracting adjustable clamp arms and one separately retracting fuel arm. > The clamp arms have switchable size settings for different rocket fuel tank diameters. The fuel arm has switchable height and umbilical sizes. > Available separately is a retracting crew elevator tower that is attached to a node above the stand's ladder. The elevator's stopping height, exit platform height and exit platform extension walkway can be adjusted with the deploy sliders in the right-click menu. > Also available separately are three versions of the fuel arm, outputting either LF/O, LH2 or MonoProp. NOTE: Fueling can't reach tanks above a decoupler due to stock resource transfer rules. > The fuel arms and crew elevator can also be used with the Soyuz Launch Pad. The clamp arm can also be turned off so the Soyuz pads's gravity-retract arms and hinge mounts can be used instead. > The stand, crew tower and fuel arms can be switched between the default gray-drab and green colors. The Soyuz Pad consists of 4 parts, all with "Soyuz" in the title for searching. > Launch Pad Base, which is attached via a size 5 node in the central hole. There needs to be a free attach node at the bottom of a rocket; usually it will be an engine that has it. The included patch files add a node to TantaresLV, FASA, Tundra Exploration and BDB parts for easier attachment. The base has two switchable hinge-mount configurations, either 4x90° or 4x45°. Four extra nodes are provided for attaching the Russian Launch Stand's fuel arms and crew elevator tower. There is an elevator on the front side which allows Kerbals to access the deck from the ground; it works by an animation, so right-click on the base to raise/lower it. > Arm Hinges, which are attached to the base at 4 nodes around the central hold. Stack symmetry is enabled. Move the hinges in and out to adjust the fit of the arms for different-sized rockets. The Tantares ALV (Proton) does fit nicely on the Soyuz Pad. > Clamp Arms, which are attached to the hinges via a node; the size of the clamp pad at the end can be adjusted using the deploy-limit slider. > Counterweights, which are attached to the back end of the arms via a node. Both the pad base and hinges have built-in decouplers to detach at liftoff. The arms retract via gravity using the counterweights. The base's central ring, clamp arms and counterweights have switchable colors, either the default green+yellow or the Russian Launch Stand's gray-drab. The Saturn Pad is very modular, consisting of various components that can be combined in various ways to fit most any rocket. > Two sizes of the Mobile Launcher Base, a standard one for stock KSP scale and a large one for real-scale Saturn V-type rockets. The standard base makes use of 2 types of a separate insert part to adjust the flame slot for different-types of rockets. The insert attaches to the bottom size 5 node in the flame slot. The base attaches to rocket via the top size-5 node in the flane hole. There needs to be a free attach node at the bottom of a rocket; usually it will be an engine that has it. Both bases have an elevator on the side to allow Kerbal access to the deck from the ground. It operates by an animation like the Soyuz pad. The standard-size base should have its front legs inside the white part of the big circle on the VAB floor to position it properly on the KSP launch pad. The large-size base should have the flame hole centered on the big circle on the VAB floor, otherwise the middle legs won't sit on flat ground. > Saturn V-style retracting tail service masts are available for use with the Square insert; the nodes for them have to be turned on first. Seven types of retracting hold-down arms are available to attach to nodes on the inserts. These retract only by staging. > The Saturn IB Milkstool is also available as an option, with switchable colors. This attaches first to a rocket, then the launcher base is attached to the bottom node of the milkstool. The milkstool's top ring has switchable configurations for attaching hold-down arms. > The tower consists of 2 types of base sections, modular tower sections, the swing arms, and the Saturn-style hammerhead crane. All can be switched between traditional red and new-era gray colors. 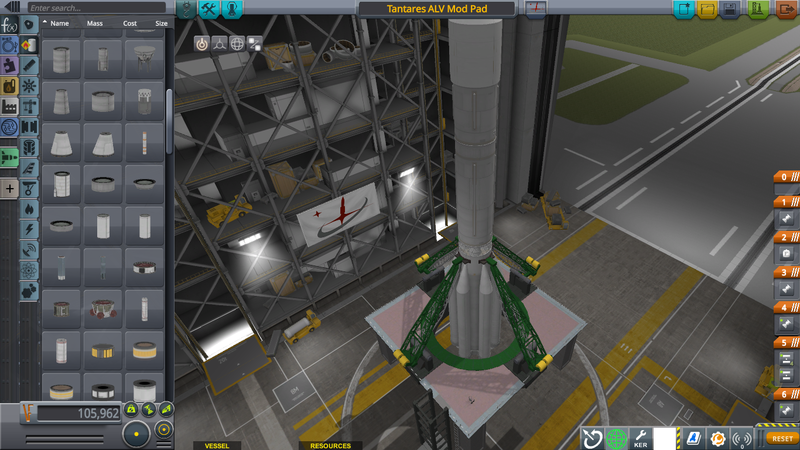 The tower bases are placed first, and have a generator, which has to be manually turned on and off, and an elevator for Kerbal access to the crew arm. The elevator is off by default, and can be switched to one of four maximum stopping heights; fine-adjustment of the elevator's height is done with the deploy limit slider. Due to a "quirk" in the stock ModuleAnimateGeneric, the elevator has to start at the top-most position to allow the deploy limit function to work properly. This means the elevator has to be brought down to the launcher base level first. The modular tower sections come in 8, 4, 2 and 1-floor versions, with switchable red and gray colors. There is also a 1-floor crew access section and a 1-floor top section that has the crane mount. The crew access section has an adjustable floor (done by right-click menu deploy limit slider) for fine-tuning the fit with a command pod. The crane attaches to the upper node of the top tower section. It has a built-in decoupler for separating from the tower, and can then be freely rotated using the 'q' an 'e' (or roll control) keys. There is no actual hoist on the crane (yet). The swing arms come in four general types, to fit fuel tank diameters of 1.875m, 2.5m, 3.75m and 5.0m. Seven different switchable umbilical types are available for each arm. There is also a special set of arms for the Bluedog Design Bureau Saturn V and Saturn IB, each with a switchable size (default or rescale), except for the Servicee Module arm. Crew access arms come in 1.875m, 2.5m and 3.75m sizes. The swing arms retract by an animation, which can be done by staging, right-click menu or action group. NOTE: Disable staging for any part that is manually retracted, or move its staging icon to a stage above the one that has the Launcher Base. Thanks! It was several weeks in the making. If someone needs help, just ask. I'll be streaming on Twitch soon, and will also try ti put together guide video. Custom patches to attach size 5 nodes to rocket parts from mods other than TantaresLV or BDB can be done by request if you don't know how to write an MM patch. I'll just need to know the mod and specific part(s). Another note I forgot: If you don't want the gray tower sections and swing arms, the folder they are in, Tower_Gray, can be deleted without any problem. just a simple question, but would it be possible to add a large land vehicle that looks like the "crawler?" @williamhall531@gmail.com I'm actually thinking about doing the crawler, and have been going over some ideas for the levelling and raise-lower systems. I think it's doable, but the tracks will require ones from Kerbal Foundries; will also see if a version using the stock XL rover wheels will work. There is an issue, when in VAB and opening the (Filter Extension) "Filter by Manufacturer" - "ModularLaunchPads", the fps drops from 60 (vsync) to 30. I have not seen such behavior for long time. When I remember right, it was InfernalRobotics 3 years ago that also had such fps drop just showing the preview animations in VAB. Just posted version 1.01 to Spacedock, as I discovered that the elevator animation had somehow been deleted from the angle base tower section; the square base sections were fine. The missing animations have been restored, and new version uploaded. @Gordon Dry Sorry, I don't know what would be causing that, as there is no support for the stock manufacturer option, and I don't use Filter Extensions, but I'll ask around. But you can mix things up too! I think I'm going to increase the height of the Soyuz pad hinges to allow for more upward adjustment without having them appear in mid-air. This looks amazing! Downloading now. Can we get a MM config for FASA and RN’s rockets? It it necessary that the bases have such a huge mass? Great work! They look great! I had thought early on about requiring launch clamps be used, but decided against it, as that would ruin the whole look of the pads, and they'd have to be placed individually, as stack symmetry goes wonky with the tructure of the mobile launcher base. In the end the simplest solution was just make the base's mass be high enough to keep it firmly on the ground. Also, career mode integration isn't actually supported for the pads right now--I just put all the parts into whatever tech tree node the part I used as a template for the .cfg files had it in. So they're probably all over the place. Basically, the pads require the Tier 3 launch pad to use in career mode. However, I do have an idea for pads to use earlier in career mode: Smaller, compact and low-mass versions that can be used with launch clamps to hold them down. The Soyuz pad is the obvious candidate for this, as it then could be a Sputnik/Vostok R-7 pad, but I could make something of a mix between the Atlas pad and the LC 34/37 pads for the Saturn I/IB, which were simple square stands with a hole at the top. Sure, I could do that, just give me some time. I also plan on making MM .cfgs for the varous SpaceX/Falcon 9 mods, as well as modern launchers like KK's Launchers pack. Next on the to-do list: a space shuttle version of the Saturn pad, due to feedback I''ve received This might require another version of the launcher base, as I might have to move the flame hole to accomodate the positioning for the FSS and RSS. The FSS will have its main support beams sunk into one of the stock launch pad's slopes on the side of the flame trench, so it will appear to be mounted on the "ground" when spawned. The RSS will then probably have to be hanging in the air when retracted...much planning to do! I also plan after that to make a SpaceX-style Falcon 9 strongback as a snap-in add-on for the Saturn pad. Not the whole current LC 39A setup, just the strongback, thus utilizing the already-made pad base and tower sections, plus the existing rectangular insert for the base that already accomodates 2.5m triple-core rockets like F9 and DIV Heavy. This is a really impressive mod. I am wondering, would it be possible for you to post the subassemblies / craft files for the launchpads? It would make using this mod significantly easier. Thanks very much! I was working today, didn't get online until later in the day. I made a .zip of the Soyuz and Saturn pad subassemblies and the craft files for the four rockets in the trailer, plus one for a BDB Titan IV with gray tower. 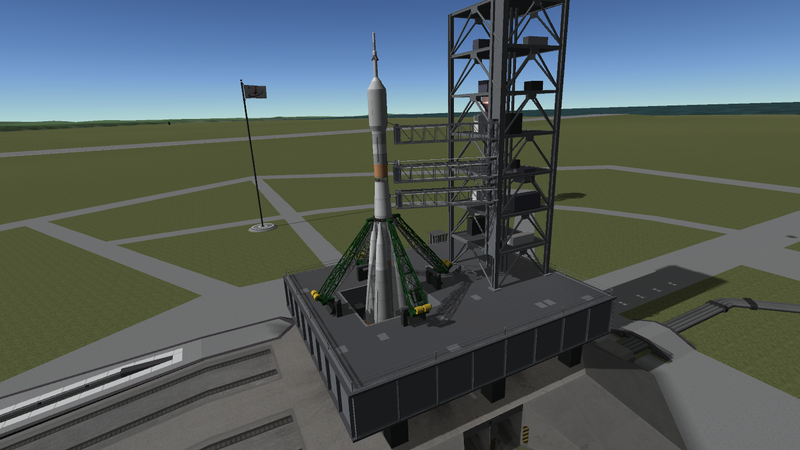 The Soyuz pad subassembly is complete; the Saurn pad is a basic subassembly with the standard-size launcher base, square insert 1 and red angled tower base section; hold down arms type 1 and tail service masts are also included. File is on my Github: https://github.com/AlphaMensae/Modular-Launch-Pads/raw/master/ModularLaunchPads_Craft_Files.zip (direct download). @TK-313 Thank you very much! Yeah, the 2 main service arms, other arms and crew elevator are on the to-do list. I didn't include them now as I was concentrating on the "clamp" arms, and since crew access to a Soyuz spacecraft would require a custom rigid clamshell fairing (not a procedural one) with a hole in the colliders to allow access to the spacecraft hatch, I didn't want to spend time on something that couldn't be used right away. @AlphaMensae will there be a road map? I'll see about making a category for them; in the meantime, I set up the part titles for easy searching: "soyuz pad" should bring up the Soyuz pad parts, and "saturn launcher" and "saturn tower' will bring up the Saturn pad parts; you can get pretty specific, e.g. 'tower arm 1.875 red" will bring up the red 1.875m tower arms. But I think before doing the shuttle add-ons, I'll make the alternative versions for early career mode. These won't be full-blown pads, but more like launch stands (with a separate simple tower for the "American/NASA" one). Depending on what ModuleLaunchClamp allows, I might even be able to make a one-part node-attached launch stand "clamp" version usable with the Tier 1 launch pad from the start. Thanks for responding to my post... I know what its like to have to work for living, that's why I try and do it as little as possible. Keep up the good work with this mod, it really adds another level of depth to launching rockets.